China is expected to overtake the United States to have the world's largest Internet population within two years, a quasi-government organization said yesterday. The country had 137 million Internet users by the end of last year, an increase of 23.4 percent year-on-year, according to a biannual report released by the China Internet Networks Information Centre (CNNIC). "We believe it will take two years at most for China to overtake the United States," Wang Enhai, an official with CNNIC, told China Daily in a telephone interview. That could be a bullish prediction. The United States now has about 210 million Internet users, according to industry estimates. 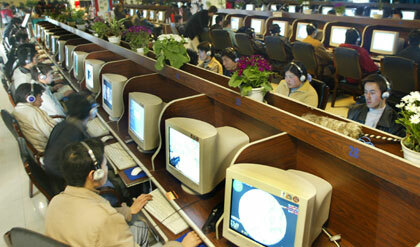 A research report by JP Morgan earlier this month forecast China's Internet population could hit 190 million by 2010. The growth in China's Internet population showed some signs of tapering off since a peak of 75.4 percent in 2002. In 2004 and 2005, the rate was 18.2 percent and 18.1 percent. "The growth is now gaining much momentum. We are expecting even faster growth in 2007 and 2008 given that Internet penetration now has exceeded 10.5 percent in the country," said Wang. The penetration has beat analysts' forecasts. A report by Morgan Stanley published on January 17 estimated China's Internet penetration at 9 per cent last year and projected it would surpass 10 per cent this year. "An increasing number of people are now getting hooked to the Web as PCs and Internet access are becoming affordable and Internet-based offerings diversified," Wang said. The CNNIC report found that Internet access in China is going increasingly broadband and mobile. The country had 90.7 million broadband users by 2006, up 41.1 percent year-on-year. And about 17 million mobile phones users are now using their handsets to access the Web. The Internet boom is on a roll that's set to continue. But as businesses continue to cash in on the boom, a promising market has been largely ignored. Mao Wei, director of CNNIC, said an increasingly mobile lifestyle in China could help spark an even bigger Internet boom. The growth of China's Internet population could get a boost after the country rolls out 3G (third generation) mobile telephony, which promises faster Internet access and downloads of data-heavy services such as videos, the director said. China had 461 million mobile phone users by the end of 2006, according to statistics released by the Ministry of Information Industry on Monday. With user penetration hitting 10 percent, the Internet would create a vast array of opportunities for businesses. "As Internet users approach 10 percent of China's population, the Internet is becoming a 'mainstream' medium," said Morgan Stanley. "In our view, most emerging sectors in China are 'sweet spots' when user penetration ranges between 10 percent and 50 percent." Morgan Stanley anticipates escalated industry consolidation in China's Internet sector this year, with "market share shifting to a few market leaders" such as NASDAQ-listed Sina Corp, Sohu.com, Baidu, Hong Kong-listed Tencent and unlisted Alibaba.